The heart rate calculator finds the pulse you should aim for when performing an exercise of a certain intensity. Read on if you'd like to know how to calculate the heart rate for your physical activities. 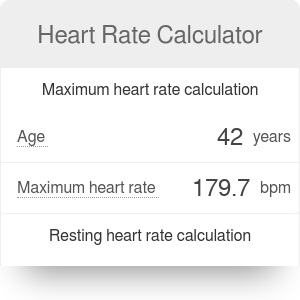 You might want to check out your heart rate zones for the optimal cardio exercise with our target heart rate calculator or estimate the maximum heart rate for your age. age - your age in years. When you start any physical activity, its intensity is soon reflected by your heart rate. The range from a moderate acceleration of your pulse to the maximum capacity is divided into heart rate zones. To put it simply, they are the levels of intensity of your exercise. If you're a cyclist, check out the cycling heart rate zone calculator for more precise results. 50 - 60% - Moderate exercise - requires a medium amount of effort. 60 - 70% - Fat burning zone - optimal heart range for burning fatty tissue. 70 - 80% - Aerobic range - intense training, leading to muscle gain and cardiovascular improvement. 80 - 90% - Anaerobic range - very intense training, causing the metabolism to switch to mechanisms producing lactate. 90 - 100% - "Red line" range - maximal effort, that can be sustained only for a short period. Heart Rate Calculator can be embedded on your website to enrich the content you wrote and make it easier for your visitors to understand your message.